Come join us for a fun and exhilarating day on the rock, and enjoy the red sandstone beauty of Moab! Our climbing school progression will emphasize fundamental risk management techniques and climbing skill, with plenty of on-the-rock experience. We have courses for the beginner to the advancing climber. All our classes offer a rewarding and successful experiences. If you have never climbed or just want to brush up your basic climbing skills, this class is for you. During this introduction to crack climbing you will learn basic climbing terminology and commands, knots and hitches. 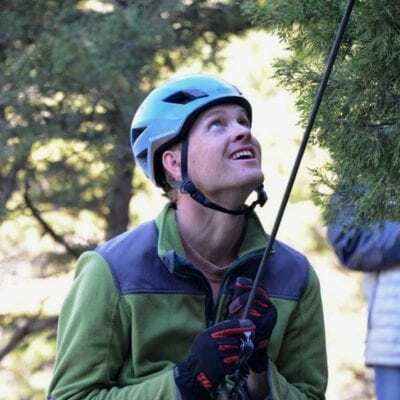 You will get a grip on belay skills by learning how to belay a top roped and lead climber. You will also learn to skillfully lower your climbing partner to the ground. Your guide will teach the nuances of movement on rock and skills specific to crack climbing. You will walk away from JHMG’s crack climbing class with the foundation to build the skills to become a climbing partner. Once you experience life in the vertical world, you will be hooked! Available as a full day event. Designed for the climber with some rock experience. Your guide will customize the class to your skill level and interest. Topics may include multi-pitch skills, placing and removing gear, anchors, lead climbing and more advanced crack technique needed for more athletic desert routes. This is a great opportunity to advance your movement and technical skills with expert instruction from our professional desert guides. This class will also help you prepare you for a day at Indian Creek or a Tower. Not sure what level you are or what class is for you? We will help assess your ability so you can choose the right course. Each class can be modified to meet your needs. Kids love to climb and so do we. This is the perfect class for youngsters 12 and under and their parents. Follow your guide to some of Moab’s best family climbing area’s. Along the way your guide will give you a tour of not to miss petroglyphs and local geology, flora and fauna of the Colorado Plateau. The family will learn how to climb on the beautiful sandstone crags of southern Utah. Kids plus two parents. Half Day classes are available please click here to inquire. Located in southeast Utah, Moab is approximately 236 miles from Salt Lake City, 355 miles from Denver, 115 miles from Grand Junction and 458 miles from Las Vegas. Most trips and classes leave from the RED ROCK BAKERY, 74 South Main Street across the street from the McStiff’s Plaza. Meeting times are determined by the season. Please contact 435-260-0990 for departure times. Many of our climbing sites are fairly close to town, while Indian Creek, Castle Valley and Fisher Towers take about an hour to get to. Once there however, there are miles of routes with close proximity to one another, making the walking time minimal when compared to the amount of climbing that can be achieved in a day. Climbing around Moab is usually about a 10 to 20 minute drive from downtown. The approaches are very close to the car and routes are located close together. Downtown Moab sits at 4000 ft. (1220 meters) so preparation is very important. It is recommended that you arrive fit and hydrated. It is also recommended that you schedule mountain biking and other adventures after you have met your climbing objectives. Southeast Utah is part of the Colorado Plateau, a “high desert” region that experiences wide temperature fluctuations, sometimes over 40 degrees in a single day. Thus the desert can be extremely hot in the sun, feel chilly in the shade and be downright cold at night. The temperate, and most popular, seasons are spring (April and May) and fall (mid-September through October), when daytime highs average 60º to 80º F and lows average 30º to 50º F. Summer temperatures can exceed 100º F, making strenuous exercise difficult. The late summer monsoon season brings violent storms, which often cause flash floods, of particular concern in canyon areas. Dressing in layers is the most appropriate for the varying conditions. Be prepared with plenty of water, and enough clothing to be comfortable in changing or windy weather. Technical Rock Shoe: comfortable fit. -an aggressive fitting climbing, sport climbing shoe is not recommended. CLIMBING EQUIPMENT The Mountain Guides does provide technical climbing equipment (Helmet, Harness and personal protection equipment) If you have your own, your are more than welcome to bring use it. Have gear questions? We’re here to help! Contact us at the Moab Office at 435.260.0990 or moab@jhmg.com. How far do we hike to the climbs? Depending on the area, the climb can start where you park the car, literally you climb right out of the car! Or, you may have to walk to the base of the climbing area. Either way you need appropriate footwear. Durable approach shoes are recommend. You can put a pair of flip flops in your pack to wear around in between climbs at the base of the routes. Do however have a good pair of hiking shoes and socks. You would hate to limit your options on where to climbing because of inadequate footwear. Take a minimum of two liters in your pack and have at least a gallon in your car. Moab is hot and arid. Hydration is key to enjoying the day and performance. What do I do for lunch? You will need to bring your own lunch. You can order sandwiches from the Red Rock Bakery and pick them up in the morning before you depart. There are grocery stores in Moab that have lunch fixing's or you can by pre made sandwiches. Aimee was fantastic. Her experience really shined through in how she built the progression of our day. We felt incredibly supported and, by the end of the day, accomplished. I would recommend her to absolutely anyone.